AMD launches a the new V-Series GPUs today with the Radeon Pro V340 dual Vega board. If you have been following SemiAccurate for a while, you realize this is not about games but supporting lots of users. The idea is similar to the FirePro S7150 x2 but taken to a higher level, support more virtual users with hardware partitioning and security. This new board packs two Vega 56 GPUs with 16GB HBM2 memory each onto a single PCB. It runs at clocks of 1500/945MHz GPU/memory respectively and has a relatively low 300W TDP. 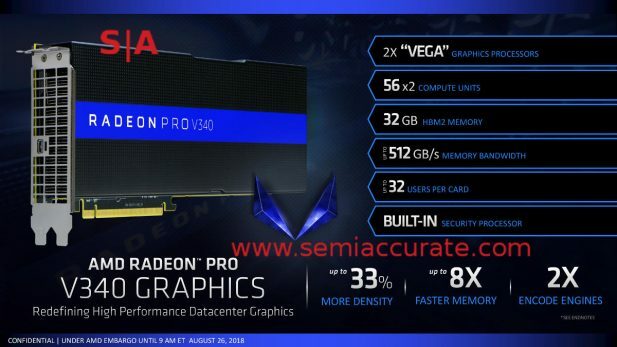 These numbers are in line with the vanilla Vega 56 cards but things get interesting when you notice there are no video outs on this board at all. Look ma, no wood screws! When we said it is not about games we weren’t kidding, this card is a virtualization device meant to support remote workers and give them performance and resources guaranteed in hardware including the now mandatory security features. Like the S7150 before it, the new V340 has 16 hardware queues each card for 32 total to which you can hard assign resources at boot. The obvious solution is you can provide each user with 1GB of memory and a time slice of roughly 100MHz but that is variable. Only the queue number, and thus supported users, is fixed in hardware, the rest is divisible as you choose. With two GPUs you can support up to 32 users per card. Given the likely bandwidth uses of the V340 with lots of users, you probably want to plug this into a full 16x slot and that means an Epyc system if you want anything more than a single card per CPU socket. That brings us to an interesting point, security. AMD has it in Epyc/Zen with the PSP providing a hardware root of trust. On top of this they build a class leading security infrastructure that Intel isn’t close to, and that seems to be what is on the V340 GPU and presumably all Vega devices. Why is this interesting? It allows the GPU to securely boot and provide secure attestations to the main system, again all in hardware. This may seem like a pointless thing to call out but the V-series is aimed at CAD and content creators. AMD had Jellyfish Pictures, a London based VFX house, at the Threadripper 2 briefing and they described how they use virtual desktops for their animators in great detail. Looking at their front page you see things like Star Wars and a host of other big name projects. Think those studios take security seriously? How about a CAD worker polishing up a new fighter jet? Hardware root of trust is not optional in these cases and it is becoming a mandatory feature even at the enterprise level faster than you realize. So in this increasingly insecure digital world, AMD is the only one that can provide a hardware root of trust on their CPU platform and on their GPU platform. And have the two talk, that is incredibly important, one side on it’s own is not pointless but far less useful in decreasing attack surfaces. Don’t underestimate the value of the PSP and SEV on the GPU side, the big players know and care about it.